In my mind, poetry books should be a little like a movie, comfortable like your favorite chair and mostly an unforgettable experience. I will agree that most poems are only appealing if they somehow find their way into your psyche and heart in a way that is comforting, shocking, beautiful or even soul revealing. Each poet is a world unto themselves and each poem is a door into a magical world where you either love or dislike the pathway you have chosen. The beauty of poetry is in how we vary in how we relate to any particular poem. In "The Best American Poetry 2006," I found so many doorways to new thoughts it was as if this book contained 20 worlds from which to view life and its many moments invisibly charged with crystalline emotions, edgy contemplations, tantalizing twists and taunting mysteries. I was relieved to read that even Billy Collins was unfamiliar with so many of these modern poets, although I was delighted to have found so many new poets whose work I enjoyed. Being a fan of Billy Collins' poetry seems to have enhanced my reading experience. His humor seems to jump out from various poems in a way that you might find his poems funny. The surprising elements seem to mirror some of his own poetic genius and his love for scene painting with delicious sentences makes many of these poems comforting escapes into a certain normality infused with the inevitability of surprise and a subtle infusion of emotional complexity. Just as in life, some of the poems have a mind of their own and take off in playful directions, almost guiding the poet's mind in a temptation of language lust. If you are looking for poems with highly complex structures and obscure words you need to look up in a dictionary, this does not produce such literary excitement, but what it does produce is a variety of emotional responses. These range from outright elation and laughing to deeply profound moods born of a life lived with longing and moments of reflection and regret. From the fascinating foreword by David Lehman to the contributor's notes and comments, this book is filled with poems, stories of modern poets and journeys through worlds we know and love. We are at times riding on a boat writing a poem that sounds more like a letter (The Ferry), entering a bibliomaniac's world where a book is more appealing than the sight of a woman (Refusal to Notice Beautiful Women) and returning to past moments of great romantic significance as in the poem by Beth Ann Fennelly. In Sarah Gorham's poem she speaks of two different ideas, but they merge and a beautiful image of souls falling like stars descends on your imagination. A poem about a Mermaid brings a sweet playfulness to the book and one poem takes you on a jaunty ride into rhythmic pleasure. There are a few poems with shocking conclusions that are quite funny and others that left me wondering how the poet was able to survive emotionally all these years to write about such disaster of the heart. My heart was captured by the poems of Kim Addonizio, Debora Greger, Mary Oliver, Mary Jo Salter, Terence Winch, Alison Townsend (she had me in tears), Reb Livingston (reminded me of childhood) and so many more. I think Dean Young has an interesting take on an idea from Alice in Wonderland. I love the rebellious spirit in "Briefcase of Sorrow" where Richard Newman teasingly takes on a quote by Frances Mayes and literally paints an image based off a few words that seem to imply failure...and the poem races past the finish line and we feel like cheering, even silently. I will admit to the difficulty of even extracting a few lines to explain the beauty of the poems, because honestly the sentences are tightly woven together with meanings the reader could miss without the entire picture being painted in a set sequence of events that draws you in and presents clarity that often leads to a mysterious conclusions with a variety of interpretations. Instead of a moment here and a line there, you receive a much fuller experience and it is also emotionally satisfying. 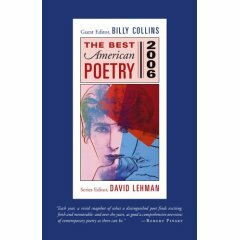 Throughout The Best American Poetry 2006 you will find deliciously modern poems with pop culture references and plenty of moments you can relate to on a daily basis. This book is not filled with poems gathered from molding collections dusty with neglect found in some forgotten library. This is a collection of living breathing poems that sing the songs of seventy-five contemporary poets who reveal to us the life we are currently living and in that is the beauty of this reading experience. If you are looking for modern romantic poetry, I can highly recommend "Eyes of the Poet" or "Poetry Collection de Jolie-Laide." For a truly magical experience you may also love " Something Familiar" by Kat Ricker. To truly say you have lived, you may also want to listen to Billy Collins read his poems. If you love this book, you will adore his poems. As a poet myself and a reader of many poetry books over the past few years, I can recommend this book as a welcome addition to anyone interested in collecting modern poems. below the shale and layered rock"
Firstly, I want to say that I love the Pittsburgh Poetry Series. Each book is about 100 pages and you can read one book right before going to bed. Poetry seems to calm my mind and encourages more vivid dreams. "The Art of Drowning" is an interesting collection. It is not as "cartoon" focused as "Questions about Angels." Although, there is some silliness to be had in "Nightclub" where we are amused by songs no one would sing. It was funnier when my husband read it to me. I'm not sure why. He and I were reading in bed and I asked him to read me some poems. He liked "The Biography of a Cloud," especially the lines: "but early one morning over Arizona it held the distinction of being the only one in the sky." He loves going to Arizona, so he could easily imagine the lonely cloud drifting across an open sky. You hardly imagine that reading poetry in bed would be anything less than romantic, yet with many of Billy Collins' poems, this is exactly what happens. Apparently I'm not the only one who was highly amused by "Nightclub." My husband was just calmly reading and I was lost in laughter as if there were some private joke only I was acknowledging. Many of the poems seem quite intimate, like cozy conversations with the reader. There is an inner vision and motion. At times Billy Collins peers into frankness as it looks back starkly and at other times his matter-of-fact observations show irony. Then, suddenly we are drowned in nostalgia, awakened by dread or simply wondering at the sheer imagination it takes to write the last few lines of "Tuesday." You have to love the "book recommendations" in "Canada," or the story of trees reciting poems in "Fiftieth Birthday Eve." Collins turns poetry into magic. These are not just words dancing before your eyes, they are living creatures jumping off the page into our imagination. His choice of words is like the choice of colors for a painting, yet the painting is occurring in minds. The better your imagination, the better the poem. You must submit the canvas for the artwork. You can remain closed, only seeing the words, or let the words into your mind and allow them to paint vivid images, recollection, connect with past memories or propel you into thinking about the future. The title of this book refers to a poem called: The Art of Drowning and it deals with the concept of your life flashing before your eyes. Here, Billy Collins takes a rather irreverent look at what happens when you die and why your life might not necessarily "flash" but might take other forms. Billy Collins' poems amaze me, not only because he can adjust his focus in a variety of amusing and out-of-the-box ways. He amazes due to his ability to make each poem an emotion or a moment in time, representative of his present condition. There are moments of longing, the dreams of travel and other places he'd rather be. There is also a comfort in the present and common life or solitude when observing nature. Many poems (in general) make me feel that I am on the outside looking in. Billy Collins' poems make me feel that I am on the inside, looking out as Billy Collins observes his world. He does at times seem to be an observer as words break on the page. There are undercurrents of emotions surging inside him and occasionally they break on the page as sarcasm, irony or a sheer appreciation for being. In "Conversion" he takes us into the past while in "Death Beds" he takes us into the future. Here we think about where we will be when we die. Not something I think about daily, but an interesting concept. an abundance of sun, a cool pillow." "Medium" is stunning because it explains how Collins would love to write on more surfaces than paper and I'm sure he realized that each time he writes a poem, he is writing on our hearts or across our minds and many of his poems are unforgettable and seep into your soul. Some of the poems will even drown you in laughter. Poetry can increase our capacity for viewing the world as a colorful, imaginative landscape of crisp words and vibrant images. In "Questions About Angels," Billy Collins presents the world in an almost animated fashion. At times his words glide across your mind like slow moving images in a movie or a long sweep of a lens. At other times, the "movie" is highly animated and takes on bizarre characteristics. The first few poems flew by my mind. I was aware of the content of the poems, they were observations, memories of childhood. However, it wasn't until I reached "Reading Myself to Sleep" that I made a connection. While I had enjoyed the endings of the first few poems, suddenly, I was relating to emotions and images I had experienced. and then slip drowsily under the surface of a page"
Then, I started to notice a unique imaginative twist to many of the poems and even an occasional tendency towards the macabre in "Purity." Billy Collins seems to see himself in an animated world where the laws of life and death don't always apply. While "Purity" is rather comical and shows a tongue-in-cheek attitude to the freedom he might be experiencing in his writing, "The Wires of the Night" is a solemn animation of death. While the skeleton in "Purity" is free, "Death" soaks itself into the poets mind and seems to present an instability and then a calm release from thought. I had to smile while reading "Wolf" because it was just rather cute. We find a wolf reading a fairy tale and later in the evening he is found knocking over houses with his breath. I am sure this poem has a much deeper meaning. Devouring words and then acting upon them or perhaps words setting us into action or leading us to our fate. While Billy Collins often seems to paint cartoons on the canvas of our minds ("Love in the Sahara" where a camel leaves a pack of cigarettes was rather comical) with a magical twist, the moment of brilliance, for me at least, was on page 70. He is describing himself as the New York Public Library. "I would feel the pages of books turning inside me like butterflies." What more can I say? This book lover has been charmed. A neighbor walking his small, nervous dog." Billy Collins seems to have moments of brilliance within poems discussing ordinary aspects of everyday living. Is this part of his charm? I think for someone to find beauty in the ordinary, you have to have a vivid imagination and transform the simple into the magnificent. Collins was reappointed to the post of U.S. Poet Laureate in the summer of 2002. He travels throughout the country for readings, lectures and is well loved by his audiences. While some reviewers don't feel his poetry has beauty, I think the beauty is when you connect with a specific poem. In this book, I had to read all the way to page 39 before anything really "struck" me as amazing. There is a cute poem about breakfast, a story of fishing and then on page 17 I found: "no matter what the size the aquarium of one's learning, another colored pebble can always be dropped in." I think what I like is the conversational style. Billy seems to mostly be talking to the reader or explaining a situation that he enjoyed. There is a casual elegance in his poems. He invites you to journey with him through the poems, although at times Collins throws in a highly imaginative sentence or an entire poem that throws you for an intellectual loop. Billy Collins vocabulary is stunning all on its own. The way he blends the words into images and colors is more than impressive. In "Journal" you can imagine yourself walking in the dark, downstairs in a robe and trying to compose an entry in a journal. Any writer knows, you can hardly go to sleep when thoughts are pouring out of your mind and begging to be dripped through a pen onto a new page. My favorite poem in this book was: "I Go Back to the House for a Book" because anyone who loves reading can relate to being stranded without a book. Here one part of himself goes back to the house while another part races off into the world. He plays with a similar idea in "The Night House," where his body, heart, mind and soul go to different areas of the house. "Moon" is rather interesting. Here, Collins speaks of our inner child and how even if we don’t have a child, we can care for our inner child. I have to laugh when I read "Paradelle for Susan," because even the poem sounds nervous. Collins repeats most of the lines. Apparently a Paradelle is not that easy to write and it might be a fun challenge to try to write your own poem in this "fixed form." Reading the poems in "Picnic, Lightning" might make you feel slightly poetic yourself. Pittsburgh Press has issued special limited edition hardcovers of three of Billy Collins' books: Questions about Angels, The Art of Drowning, and Picnic, Lightning. I'm thinking I need to find an autographed copy of "Questions about Angels." 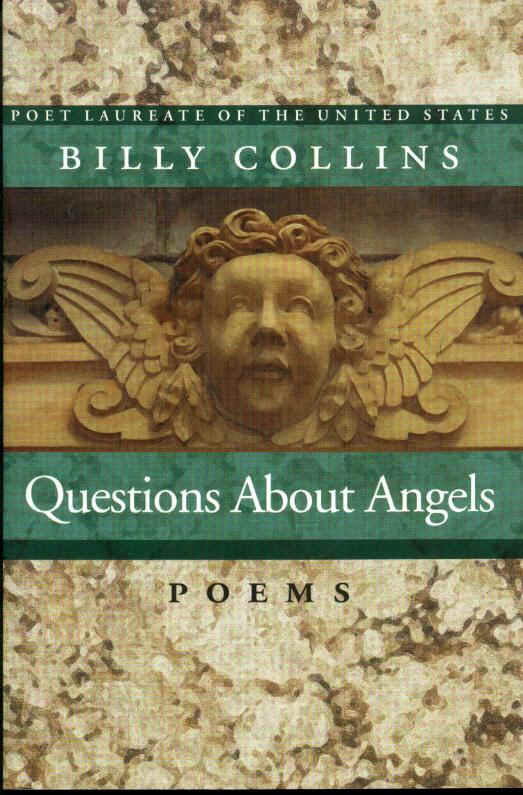 If you are just starting to read poems by Billy Collins, I'd start with "Questions about Angels." Billy Collins Poetry Read by Billy Collins - the best way to experience his poetry! Listening to Billy Collins read his poems gave me a new appreciation for his genius. His poetry increases my capacity for viewing the world on a new artistic level. While listening, I had moments of nostalgia as images danced across my mind. 1. Another reason I don't keep a gun in the house - A story of a dog barking. He humorously mixes images of a barking dog solo and Beethoven. 2. Shoveling snow with the Buddha - Winter work ends with warm drinks. 3. Marginalia - An especially enjoyable poem for anyone who loves to find scribblings in books. 4. Afternoon with Irish Cows - Completely vibrant images. You can truly see the images poem. 5. Walking across the Atlantic - An imaginative journey while walking on the water. He imagines what the fish must think about the bottoms of his feet appearing, disappearing. 6. Intro - An introduction that explains the title of this CD. 7. Consolation - Written to consol himself after canceling a trip to Europe. 8. Forgetfulness - If you are over 30, this makes complete sense. An intensely comical poem that will be appreciated by anyone trying to remember the name of a book or name of the author. 9. Workshop - Newbies enjoy entertaining Billy Collins with their artistic expression. 10. Morning - Feet on a cold floor and espresso while the typewriter awaits. in how he places himself at various points - the car hood and the backseat. 12. Wolf - A wolf reads a book of fairy tales. This is perhaps one of my favorite Billy Collins poems. I love the description of the fur bristling and how he turns each page with his nose. how he writes romantic poetry is almost an interesting insight into male sexuality. 14. The Art of Drowning - Will you really see your life flash before your eyes? 15. Nostalgia - "Remember the 1340s?" I love this poem because it is a humorous visual journey back in time. 16. Candle Hat - A poem about a Goya painting. 17. Sweetalk - Art lovers will enjoy this love poem, especially the twist at the end. 18. Instructions to the Portrait Artist - Interesting insight into the poets' love of the intellectual life. 19. Pin-up - Decadent descriptions of murky garages and mechanics. 20. Flames - Smoky the Bear with his fur gleaming in the sun. 21. Saturday Morning - Casual observations and lazy day moments. 22. The Afterlife - Secrets from the afterlife and how you go to the place you always thought you'd go. Fun idea. 23. Man in Space - Male/Female relationships. 24. Aristotle - Thoughts about a beginning, middle and an end. 25. Wires of the Night - Especially beautiful recollection about death. 26. History of Weather - Flower ruffling breezes and heat shimmering on sand. Images of clouds, rain on battlefields and snow flurries of Victorian London. 28. Invention of the Saxophone - Mentions a historical character from the 13th century. 29. Child Development - Fish work up irregular verbs and children work on name calling. 31.The First Dream - Wind ghosts around the house as he leans against the door of sleep. 32. Japan - Reading a favorite Haiku. 33. Thesaurus - Lover's in myths and a congregating of word relatives. I love this one because I love words and Billy Collins has an especially creative way of exploring word meanings. 34. Nightclub - My husband read this to me once and I thought it was hilarious. Billy Collins' wry wit and his eloquent voice contribute a comical resonance. His comic timing is impeccable and I finally understood some of the humor in his poem "Consolation" about "not" touring Italy. He gives a bit of background, which changes the entire poem. By the end of this reading, he has left the audience deliriously giddy with laughter. I love the twists at the end of his poems that instantly captures profound emotional moments. There is a casual elegance in his poems. He invites you to journey with him through the poems, although at times Collins throws in a highly imaginative sentence or an entire poem that throws you for an intellectual loop. Billy Collins vocabulary is stunning all on its own. The way he blends the words into images and colors is more than impressive. If you are in the mood for intellectual beauty, this CD will give you a deep appreciation for laid back and artistic observations. 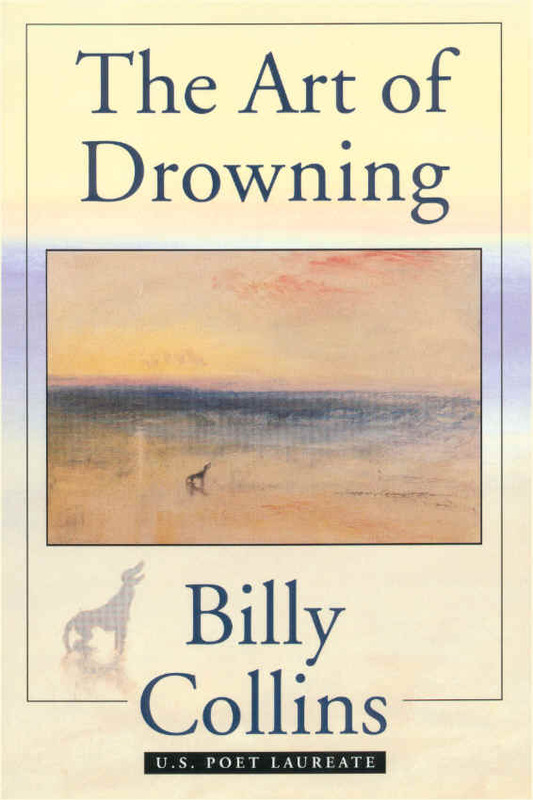 If you are already a Billy Collin's fan, Pittsburgh Press has issued special hardcover limited editions of three of Billy Collins' books: Questions about Angels, The Art of Drowning, and Picnic, Lightning. Dedicated to Eric who found my Billy Collins book reviews and thought I'd enjoy this wonderful recording. Thank you! This was a beautiful gift. Used books hold within their pages additional mysteries and this one was no exception. Also, when the first poem in a book makes you cry, it is almost guaranteed you will be finding additional poems to love. "That Cold Summer" by Nin Andrews is so startling in imaginative beauty and many of the poems seem to flow together with a similar idea. assessing opulent stucco and glossy indigo." you stay close to the shore." 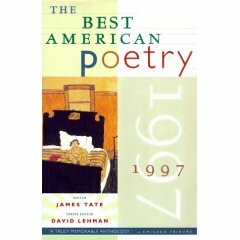 I thought it was rather intriguing that when I had just read The Best American Poetry book edited by A.R. Ammons, that I should open this book and find a "Worldwide Travel Specialist's" business card right at his poem: "From Strip." While I wouldn't mind a vacation to New Zealand, I do find many of the poetry books by David Lehman to be journeys into many minds and enjoyable escapes into poetry. "she was, like a piece of the sky looking at herself. until he touched her shoulder, and he shuddered. wind inside her than fanned the flames a brilliant blue." ~ from Nin Andrew's "That Cold Summer"